A. You're absolutely right - both the solid green and variegated leaf forms of goutweed (also known as bishop's-weed and snow-on-the-mountain) are very invasive and hard to control when mixed with other plants. Surprisingly, I do occasionally find the variegated form sold in local garden centers as some people must find the plant to be irresistible? Since these weeds are in very close proximity to desirable plants, it will be impossible to spray a liquid herbicide with enough accuracy to guarantee that only the weeds are treated. In addition, common granular herbicides that are marketed for controlling weeds in flower beds (e.g., Preen) are effective only against seedling annual weeds, not established perennial weeds. Therefore, you’re going to want to use what I refer to as a “glove-in-glove” technique for applying a non-selective herbicide containing glyphosate as the active ingredient (e.g., Roundup, Kleenup, etc.) directly to the leaves of the weeds you’re trying to control, above right. While you may think that you’re wasting your time as very little herbicide will be applied to each leaf, a little bit of glyphosate actually goes a very long way! 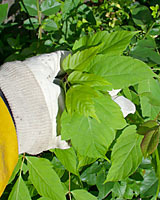 Unfortunately, because many invasive perennial weeds such as bindweed, horsetail, goutweed, etc. are very persistent, you may need to repeat this process several times over the course of several growing seasons before the infestation is brought under control. Meanwhile, to insure that your friend doesn’t give you more than you bargained for in the future, wash all the soil from the roots of her gifts before transplanting them into your garden, above left. 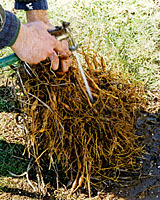 Just make sure to prevent the roots of your “bareroot” divisions from drying out before you can get them planted in your garden by wrapping them in damp newsprint, for example?